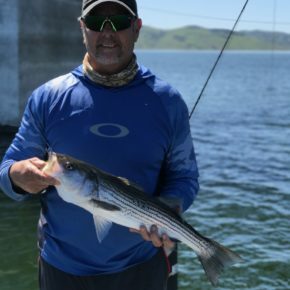 Saturday April 14, 2018 – It’s hard to believe that its raining snowing today in Chicago and Im out fishing San Luis Reservoir in a T-Shirt. One of the things I really look forward to every week is talking to my kids while Im fishing. Mark lives in Chicago and Mia lives in Charleston South Carolina. The 2-3 hour time differences work out well, since I often talk to one of them while I drive 50 minutes to the lake. 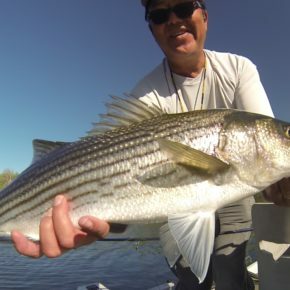 When the fishing gets slow, Ive noticed that I catch more fish when Im talking on the phone then when Im concentrating. I think talking changes the pace that I fish. I fish slower and with more pauses and micro movements. Some of the biggest fish Ive caught in the last couple months have been while Ive been on a call with the kids or the office – weird facts. I got on the lake at 8:00 am and 6 boats were ahead of me. 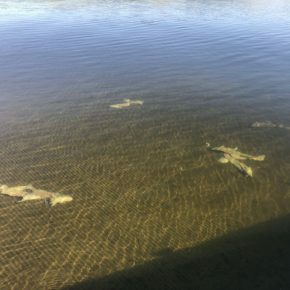 Someone the night before had filleted 14 stripers at the launch and threw the carcasses into the lake. 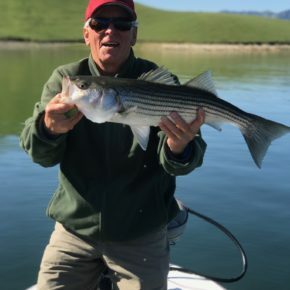 All 14 stripers were over 25 inches. The trollers must have it dialed in. The fish in the lake are definitely averaging larger than last year at this time. The lake is over 90 percent filled and the pumping has stopped for now. The fish were tough to catch today. I managed ten for the day and left at 2:30 after not getting a fish for an hour. My largest fish today was 8 lbs and I brought it home and cooked it for dinner. Cleaning it, I found a 5 inch threadfin shad in its stomach. That should keep my busy at the Fly Tying bench for awhile. The dozen fish I caught today hit a slow fly deep. They dont seem to be aggressive yet this year. I met up with Vaughn and Steph at Romero today and we had a great time catching fish under each others boat and talking. Its been a long time since we all were on the lake in the same place. Great guys. Steph gave me some incredible boar sausage with Jalapeños and Cheddar cheese. They were awesome with dinner. Steph and Vaughn ended the day with over 20 fish and they were on the lake till 7:30. Ive never tried the evening bit. Ill have to plan a late afternoon trip. Nate was hammering them on the deep drop and strip at the trash racks today. He is definitely dialed in on the technique and Steve got a nice one. The horn went off today with no car in site. I wonder who is doing that? It could be either Romero Lookout or the Basalt Check in. Monday is Henderson Springs for three days. Im looking forward to catching some trout. 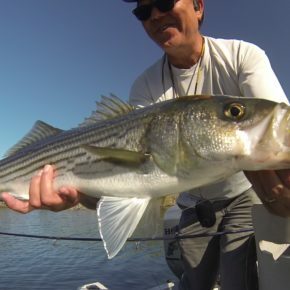 I hope I can still set the hook with finesse after all these stripers sets. California Fly Shop just announce it is closing tomorrow. It is with a heavy heart that we have made a business decision over an emotional one: to close the store for good on April 15th, after 12 years of business. It’s been a great privilege to help build this fly fishing community and to have been able to serve our customers over the years. The exorbitant cost of doing business in the Bay Area, combined with the migration of sales online and the direct competition of manufacturers, has made it an overwhelming challenge to keep our brick and mortar store thriving. We have loved talking to and fishing with you, our fly fishing community of friends, and hope to see you all on the water one day. 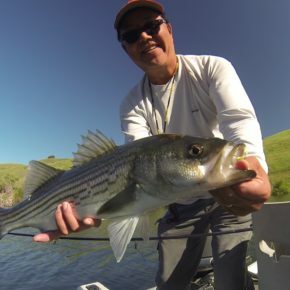 Xavier will continue to do adventure travel and fly fishing education, so if you are interested in staying in touch please send an email to karen@californiaflyshop.com and we’ll put you on his travel/education list. 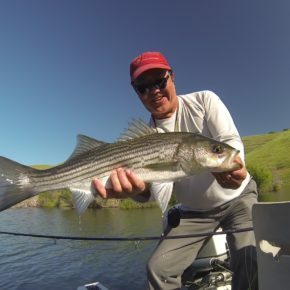 April 15, 2018 in Fly-Fishing Reports and Subjects, San Luis and Oneill Forebay.